Aluminium. 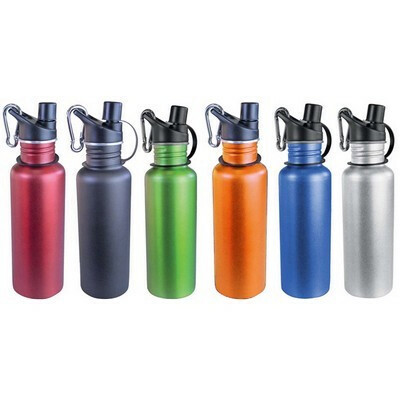 710ml aluminium sports bottle with user friendly sport cap and carabiner. Fits most cup holders. Opening is wide enough for most ice cubes and cleaning brushes. BPA free. Gift box included. Personalized printing available. Red, Orange, Green, Blue, Black, Silver. Product Size: 270Hx76D mm. Print. Size: Horizontal: 44Hx44W mm Wrap: 127Hx197W mm. Price includes : Print Up to 1 colour. Setup is additional. Please contact your sales representative for a final quote.